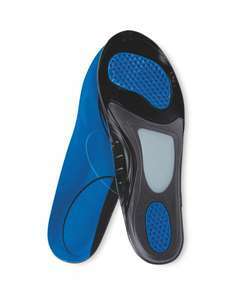 Help take the strain off your feet, joints and ligaments with these super comfy gel layer inserts. 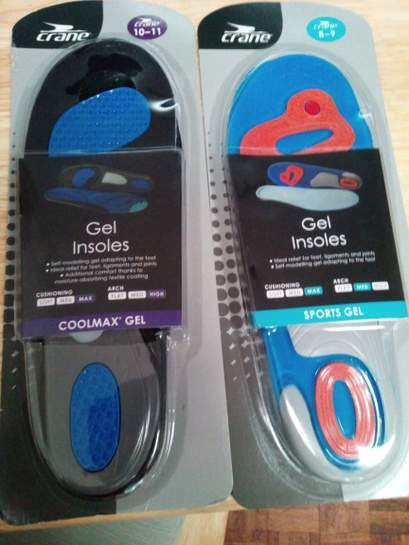 Increase the comfort of your footwear with these self-modelling gel insoles. Cold - Aldi does not believe that any men have bigger than size 11 nor are there any men with wide feet. Either Germans all have tiny feet - what does that their say about other parts of their anatomy - or there is a German led conspiracy against big-footed men. £20 minimum order for free delivery. Should add £2.99 delivery cost if onlibe. Anyone tried these before? I can spend between 6 and 12 hours a time at work stood on my feet and could do with something to take the strain off as its leading to lower back pain. Anyone tried these before? I can spend between 6 and 12 hours a time at …Anyone tried these before? I can spend between 6 and 12 hours a time at work stood on my feet and could do with something to take the strain off as its leading to lower back pain. I've tried the Scholl (sp?) variant & they were pretty good. I gotta say though, I don't know if they'll do much for lower back pain, that tends to be more about posture & sheer amount of standing than footwear. Source: working retail, having lower back pain & physio to sort it out. Bought a pack of the size 10/11. I take a size 13 but these insoles are practically the same size as the size 13 insoles they're replacing. They're less than half a cm shorter. The 'cool gel' insoles' packaging says they are for high arches so I'm hoping they'll help with plantar fasciitus. There are some products that not worth buying when it's cheap, and this is one of them. I recently had sports injury while running, and following appointment with podiatrist, I got insoles of Bio Orthotics, and I warmly recommend. They do cost over £50 but worth every penny. My advise is, ask your doctor/GP/Podiatrist before buying any insoles. Note to self. Don't drink tea while reading HUKD comments. Nearly died choking! Worth a punt for £2.49, Shirley? I only could find medium and high arch. I bought a previous model from aldi like 2 years ago and i couldnt find cheaper option that works.